©1995 Robert Wright (P)2010 Audible, Inc. The Moral Animal is THE book on evolutionary psychology. Robert Wright applies a straightforward game-theoretic analysis to theorize how natural selection shaped human psychology, and gets remarkably penetrating insights into human nature. I feel like I am seeing human nature laid bare. I find myself shaking my head in awe, because after I hear Wright's characterization of some social dynamic, it seems so clear obvious in retrospect that I can't believe it's not common knowledge. I also love the way Wright applies the principles of evolutionary psychology to analyze episodes in Darwin's life. Wright's Darwinian understanding of human nature enriches the book's view into Darwin's life. This is one of the best books in the entire Audible collection. A must-listen. 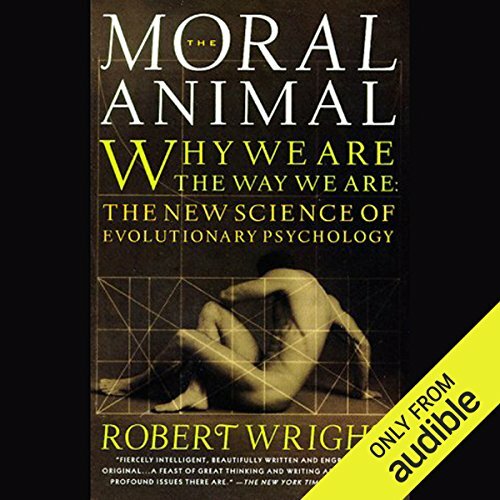 Robert Wright's 'The Moral Animal' is a phenomenal look at the science of evolutionary psychology, using Darwin's own life (and his published and unpublished writings) to organize and explain various ev. psych topics like: marriage, families, society and social status, and morality. 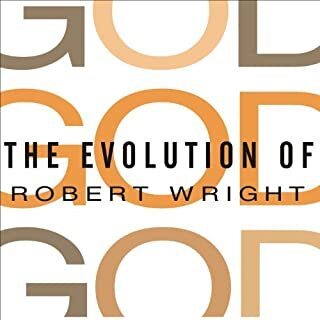 In a growing field of popular books on psychology, geology, economics, evolution, etc., Wright tends to stand apart (along with the likes of E.O. Wilson, Richard Dawkins, Steven Leavitt, Michael Lewis, John McPhee, Oliver Sachs, Michael Shermer, etc). It all tends to fit into Wright's 'big thesis' on non-zero sum relationships. 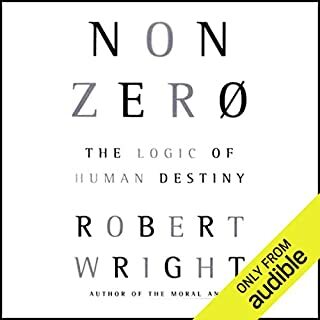 If you haven't read Wright's 'NonZero', or 'Evolution of God', go pick those two up after you read/listen to this one. They are all fantastic. Greg Thorton does a good job of narrating this masterpiece of science writing. Robert Wright’s Moral Animal (1995) is not one of the new books on the topic of evolutionary psychology, but it is a start. Here Wright explains thinking associated with evolutionary psychology and links it to the life and teachings of Charles Darwin. The book is thought provoking and gently takes the reader into this relatively new psychological perspective. Wright’s consideration of kin-related altruism was of particular interest to me. For my taste, however, Wright spends more time on Darwin’s biography than on introducing evolutionary psychology per se. I will look further to learn more. Greg Thornton's reading is a plus. 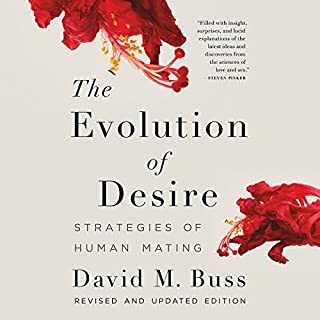 This is a profoundly insightful book that explores the inner evolutionary workings of the human being in regard to what we term moral behavior, particularly in the sexual realm, as Wright sees the reproductive urges and needs of the male and female animal as being perhaps the greatest inner (and thus often highly subconscious) motivators of almost all "moral/immoral" behavior and views them as the very source of the need for moral systems to start with. A fascinating read and a great introduction to the growing realm of evolutionary psychology. The book is a Darwinian slant on Darwin the man and its new paradigm (evolutionary psychology). I only started to fully appreciate this book after I realized it was not a science book for non-scientist, but rather a philosophy book for non-philosophers. The author coherently ties together through an overriding narrative on our human psychology and moral development. 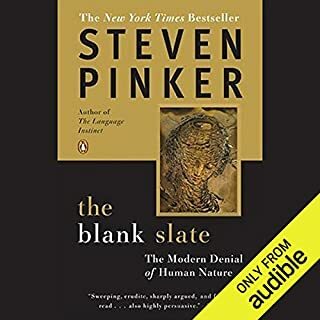 While I've listened to most of the more recent books on the same topic from various authors (Dawkins, Diamond, Pinker, Gazzaniga, Wilson,Kahneman, and Ridley) available on Audible, none of them tied together the story as well as this book and make you feel the philosophical implications of the theory of evolutionary psychology. The book is dated (copyright 1994) but not out of date. Most of the stories told in the book I've heard versions of them in the more recent books. That's not a fault of the book. It's just that I read this book (in 2012) after having read the other books. I enjoyed this book so much that after listening I started listening to his other book, "Nonzero". Warning: this book has the ability to make you reassess you place in the universe and become more interested in philosophy. Enjoy. This book was written in 1994, and its underlying philosophy holds true today, even if a few other theories on evolutionary psychology have eclipsed what Wright has written here. (Just as what Charles Darwin has written is still powerful despite the work that has been done after his death, interestingly.) For those of us who are atheists, a book like the Moral Animal becomes extremely important because it shows that morality does not need to come from a deity, and instead likely comes out of our own interest in passing our genes to the next generation. Although I personally feel that at least some morality need not come out of clinical self-interest. Nor does it always need to be explained. The Moral Animal along with Wright's latest book, The Evolution of God, have, inadvertently or tangentially, done more for the cause of atheists than any works before, during or since. Remember its one of the first of its genre! The book is excellently written posing some of the most interesting and stimulating questions and ideas in evolutionary psychology. I personally find evolutionary psychology a crippled discipline that seeks self-confirmation over asking open ended questions. Having said so I still find Wright writes with a positivity and does not degrade men to mere animals (unlike the title may suggest) like many other writers of the same subject. Also while it is awesome to realise that such information was compiled and presented back in 1994, it is sad to see absolutely nothing worthwhile, nothing groundbreaking aimed at the general public has been published since then, despite the huge advancement in technology and data compilation. Evolutionary Psychology was a new topic for me and I found the presentation to be interesting and understandable. The last part of the book, where the author attempts to deal with the moral/ethical issues raised in the first part, was not nearly as interesting to me as the 1st part. There were 2 aspects of this book that made it memorable. First is the excellent narration. This is the first book that has prompted me to look for others by the same narrator, and sadly there is only one. Greg Thornton has a pleasant voice with a slight accent. It reminds me of Ray Romano's voice. And the delivery helped to keep my attention from wandering (as sometimes happens with audiobooks) without being overdone or distracting. Secondly, the author's frequent use of material from the life of Charles Darwin to illustrate the material he was presenting was a bonus. I never expected to find a biography of Darwin embedded in this book. I was absolutely amazed that a theory of origin could so succinctly describe and explain the rationale for modern human behaviour. I am a born skeptic but, this work is very good. What a beautiful gift it was to learn from this book the true nature we hide from ourselves and by knowing, to gain power over it. Reading this book was an exercise in liberation. As some skeptics of evolution have said, "the truth will set you free" and so it does. To make the information more readable and to explain his points, the author brings in stories from Darwin's life from his love for his wife to his devout faith in god. This does makes the book less academic and more personal. The narration was very well done and easy to listen to. It may be the case, that any first book I were to read about the new Darwinian Paradigm would change my life - but the fact is that I read this one. Wright's delivery is comprehensive, powerful, razor sharp, enjoyable, challenging, insightful, inspired and inspiring. Truly a work that will go down in history as a herald of morality's future. Wright's book is essential reading on, and a monument to the aspirational leanings of early evolutionary psychology. He does an excellent job of benchmarking the scientific understanding of evolution and psychology in the waning years of the 20th century. But the book was much more a work of yearning, than one of sober scientific understanding. Wright intertwines the personal biography of Charles Darwin amidst a continuous stream of speculative theories about the purposive role of reciprocal altruism, relatedness, kin selection, and social 'fitness', in our genetic heritage, using Darwin as a kind of "patient zero" role model for these theories. The goal of all of it, as the title of the book exclaims, is to understand "why we are the way we are". But Wright doesn't stop there. Despite numerous cautions against the urge to derive rules for living from natural purposes, even appealing directly to G. E. Moore late in the book, he still couldn't help himself but turn the book into an attempt to derive some sort of "moral of the story" from the various theories he'd sketched in the previous chapters. This, I think, was a mistake. It was as if Wright was confused about the purpose of his own book. Is it science, or philosophy? After a long trek through the psychological and biological literature, suddenly we're thrust into a long discussion on Mill's Utilitarianism, and Darwin's particular flavor of it. And in the end, a meander into the religious tradition to ponder on questions of self-sacrifice, brotherly love, and self-denial. 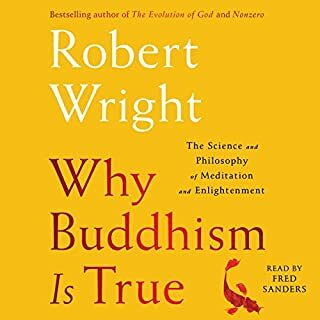 Ultimately, Wright ignores his own warnings, and seems to counsel for a kind of detente between the rational and the biological self, in which we seek self-awareness, but not *too much* self-awareness, and follow Darwin's role model of a psychology cynical of the self, but generous toward others. 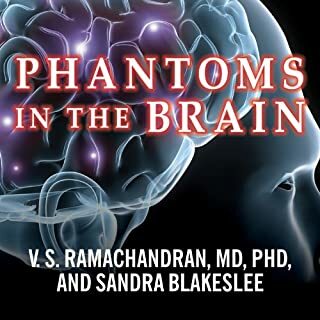 As a founding document in the literature of evolutionary psychology, this work is definitely worth the read, but don't go into it expecting much in the way of answers. It's so early in the game, all it has to offer is a long string of questions. Maybe that's it's greatest strength, actually. I thought the way that Robert Wright uses Darwin himself as a case study for the behaviours discussed was very clever, although it felt in many ways to be a biography rather than an exploration of evolutionary psychology. He does however cover quite a lot of material. Whether it's "new" I'm not sure. The narrator was probably the worst part of the experience so if you don't mind him then you will likely find this interesting and Informative. One of the best books I have read. Explains evolutionary psychology in an enjoyable and detailed way. Interesting but felt a bit long winded at times. the use of Darwin thought-out also seemed a little forced and at times irrelevant. When I read the synopsis of this book I was so excited to get stuck in and learn but unfortunately I’ve not been able to finish it. The narration is so dull and boring I found it painful to listen to. I’m sure he’s a lovely person but he made me want to pull all of my fingernails out one by one. Not what you want from a bedtime story. I would advice anyone who is thinking of getting this book to listen to the short clip and see if you can handle his style. I wish I had. The best book I've read/listened to in a long time. So many important and valid points, it's almost overwhelming. Would you listen to Moral Animal again? Why? Yes. So much information within this book it will defiantly be worth a second and third listen. Well its not so much a story but a insightful look at how and why we do things. Very eye opening and enlightening, helps you understand your own and others actions. Really enjoyed listening to this and would definitely recommend it. Especially if you have any interest in psychology, evolution or anthropology.Helps to explain our own and others actions. Terrible narration voice for such a good book. Very disappointed, he sounds a bit strangled, why do so many audiobooks use such poor narrator voices?! ?